The jam has ended, and the voting has started already. Check out the answers to this question and the games inside them, and vote them up if you think they deserve it. Downvotes are fine if that's how you want to vote, but at least leave a comment so the creators know how they should improve. The voting will end on Sunday, November 9th, at 00:00 UTC (7 days after the end of the competition, minus a few hours so that I can be awake to close it) If you wanted to participate but didn't have the chance, don't be sad! There will be another jam in the Winter! The Anniversary Game Jam 2014 will officially take place between October 31st 5am and November 3rd 7am UTC. Effectively Friday evening through to Sunday night for your time zone. Please submit your game before Sunday late-night for your time zone as you will not have time to work on your game on Monday. Participants are allowed to write games for any platform. All publicly available libraries and middleware are allowed. All publicly available creation tools (e.g. Photoshop or 3DS Max) are allowed. The entrant is allowed use any premade assets as long as they're freely available on the web before the start of the jam, and the licenses allow them to be used in an open source project (e.g. opengameart.org). If you plan to use assets you've created prior to the jam, release them to opengameart or the like before the jam begins. 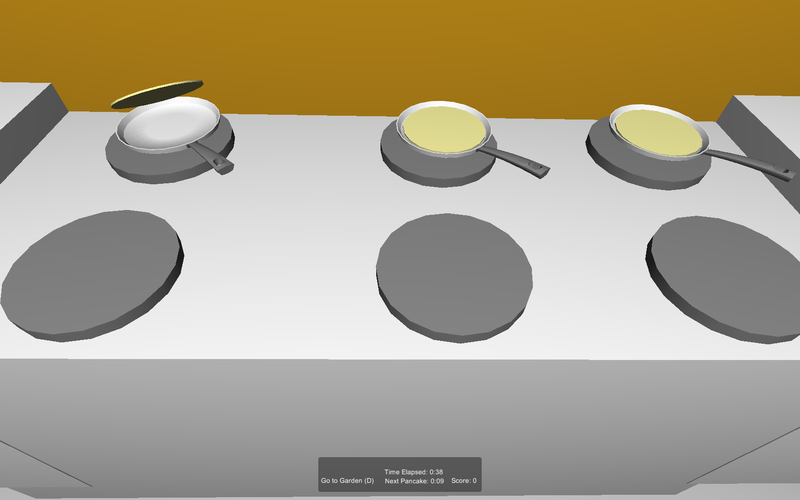 Assets created by the entrant during the game jam may also be used. The forming of teams is not allowed. Each entrant may ask questions on the main gamedev.stackexchange site, as long as the questions are on-topic as per normal site rules. Alternatively, the chatroom may also be used. Each entrant must release their game as open source after attaching a license of their choice. When your game is complete, add an answer here with a link to a playable version, a link to the source, a screenshot or two, and what your 5 words were. Don't forget to vote on the other games, and have fun! Please refrain from voting on your favorites until the jam has concluded. You will have an entire week to vote on the games at the conclusion of the jam. This question does not appear to be about Game Development Stack Exchange or the software that powers the Stack Exchange network within the scope defined in the help center. 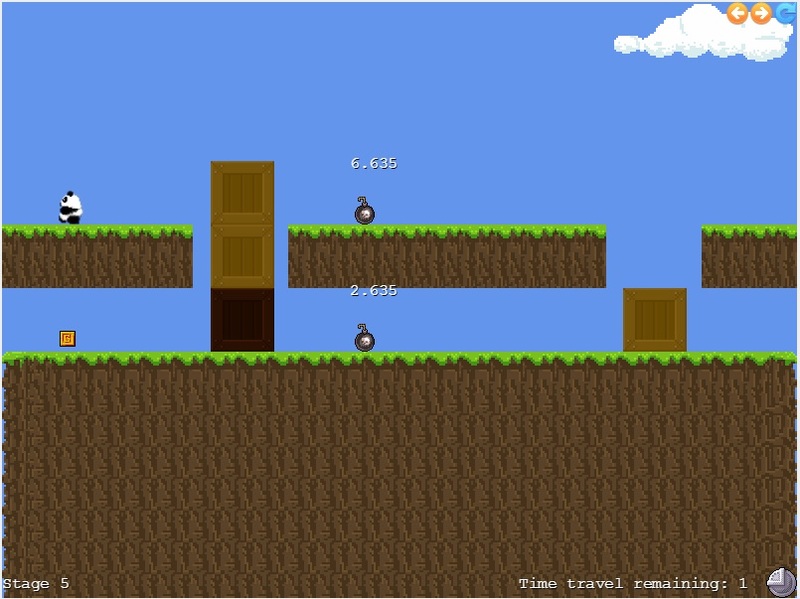 In this puzzle / platformer game, you control a panda. The goal is to collect the yellow token to advance to the next stage. The panda can push the light brown crates and bombs, but can not be blown up by the bomb. The panda has the ability to "time travel". Time travelling allows the panda to maintain his current position on the map while "resetting" the puzzle to what it was in the beginning, allowing him to perform actions that were previously not possible. He can only time travel a limited number of times per stage. Note: It might take a while to load. If you get a black screen, it's loading. Also, some people have had problems on Firefox. If you do, try it on Chrome. Use the arrow keys to move the panda. Spacebar or the up key to jump. Use "T" to time travel. Icons on the top right of the screen allow you to jump between completed puzzles and reload the current puzzle. 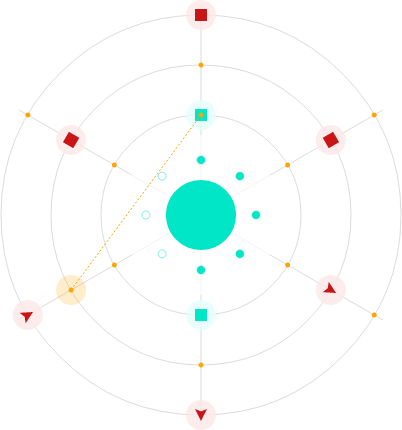 It's a web-based puzzle game; inspired by Niels Bohr's electron energy level theory. Aim: Destroy red anti-electrons around your atom, by touching them with electrons. Controls: Arrange the green electrons on orbits with drag-and-drop, then click the nucleus (center circle) to set them off moving automatically. Click on the nucleus again to reset. To skip between levels, click the little level indicators around the nucleus. Rules: (The levels are tutorial-like, so maybe just play it.) Electrons move clockwise along their orbits. Each has a "spin" (direction indicated by icon), which determines whether it stays at the same orbit height (square), rises by one every step (up arrow) or drops by one every step (down arrow). Electrons disappear if they go above the highest orbit or lower than the lowest. When an electron destroys an anti-electron, it absorbs its spin and starts moving in that way. Written in LiveScript, rendered in SVG with D3.js. Sounds in Bfxr and SunVox. More details and build instructions in the README.md. COW POWER! Make your cows work for you by sending them to the mill where they will increase your cow power. The more cow power you have, the more Cattleium your farm will have. 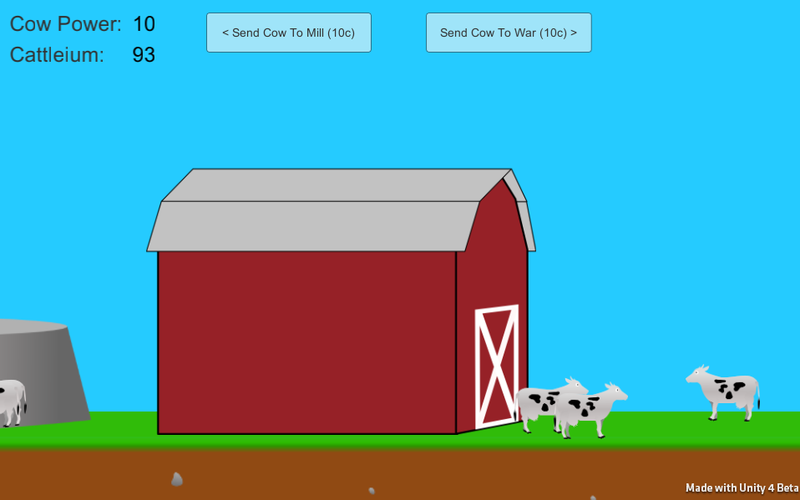 Spend Cattleium on more cows! Alternatively, send your cows to war! The first side to successfully hit the opponent's barn 5 times wins. Controls: Click and drag \ A \ D \ LEFT \ RIGHT to look around. Click the giant buttons in the top center to do stuff. Cows cost 10 Cattleium each. You start with 10 cow power (generated by the wind), and each cow increases your cow power by 1, who figured? All assets were made myself. Thank goodness I found a decent cow to trace. Traces is twin stick shooter (currently only mouse and keyboard) with a pseudo-3D aesthetic. The goal is to power each building with the laser beam in sequential order all while killing or avoiding the enemy blobs. Activate the first building in sight and find the next building at the end of laser beam. Eat meat to restore your health. 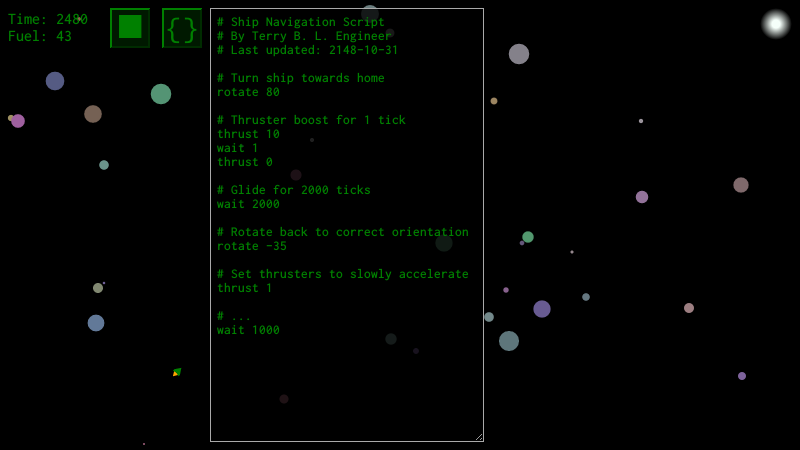 Guide your crew home by programming your spaceship to reach that distant wormhole. Don't get too close to the planets or their gravity will crash you. Try to win with the fastest time, shortest script, lowest fuel expenditure, or most acrobatically awesome gravity assist! Gameplay is self-explanatory. My themes were: Meta, Wormhole, Tactical, Unity, Bears. Try to guess which ones I picked! 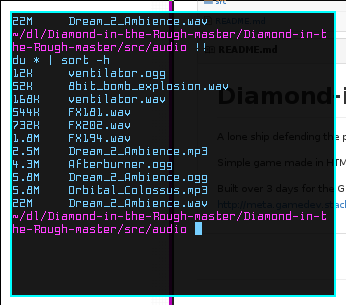 I wrote this in a hurry (single digit hours) because of a busy weekend, and you can tell by playing and looking at the code just how rough around the edges this game is, so I'll definitely be taking this further after the jam! P.S. If a level seems impossible, refresh to regenerate from a new seed. For best results, download the entire src folder from Github, unzip it, and open index.html. Don't forget to brag about your score in the comments! The game works perfectly fine if you download the src folder, unzip it, and open index.html in Chrome. The sound issues in Chrome are ONLY when it is hosted online. Not the answer you're looking for? Browse other questions tagged discussion gamejam . Should we be running the game jams on meta or elsewhere? Suggest or choose a theme for the Fall 2013 GDSE Game Jam! The 2014 Spring GDSE GameJam!